You can now try Azure Cosmos DB for free for an entire month! This trial allows you to evaluate Azure Cosmos DB’s capabilities for free for 30 days, including creating a database with up to 25 containers (collections) and up to 10,000 Request Units (RU)/second of throughput, no Azure subscription or credit required. Get started with Try Azure Cosmos DB. Azure Cosmos DB is also included in the Azure free account, which includes 400 RU/s for 12 months. With these changes, you can create a new database, container, and add an item in 10 lines of code! Cosmos Explorer provides a full-screen standalone web-based version of the popular Azure Cosmos DB Data Explorer. With Cosmos Explorer, you can access your database accounts and containers, run queries, and view results, all with the full-screen real estate. You can also share temporary access to authorized peers, without the need for them to have subscription or Portal access. 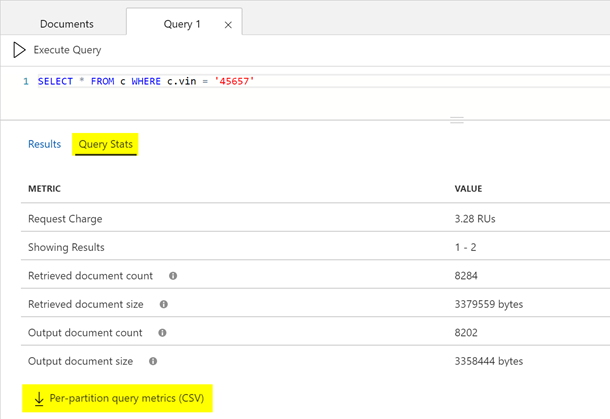 Cosmos Explorer also supports showing query execution metrics, under the Query Stats tab. You can also download a CSV to view detailed metrics at the partition level. 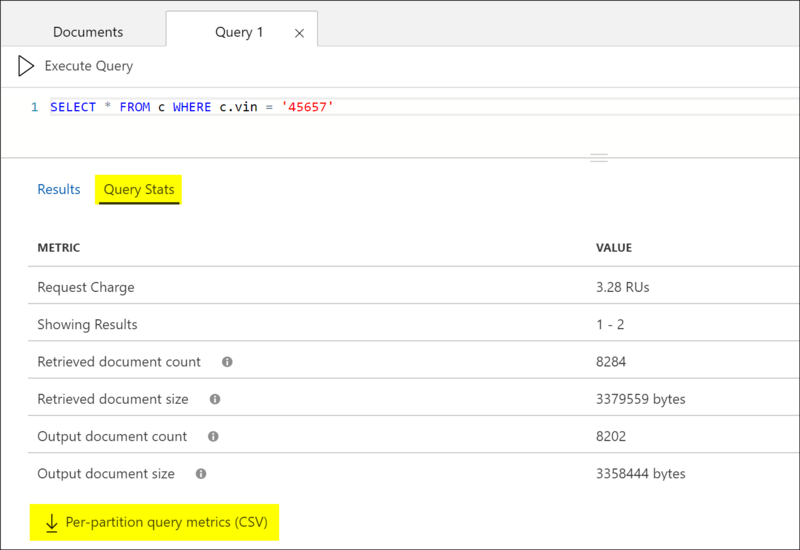 Learn more about these metrics and how to tune your queries in Azure Cosmos DB. To try Cosmos Explorer, navigate to Data Explorer, and click the Open Full Screen link. You can also go directly to https://cosmos.azure.com/ and paste in a connection string. Learn how to use Azure Cosmos DB explorer to manage your data. 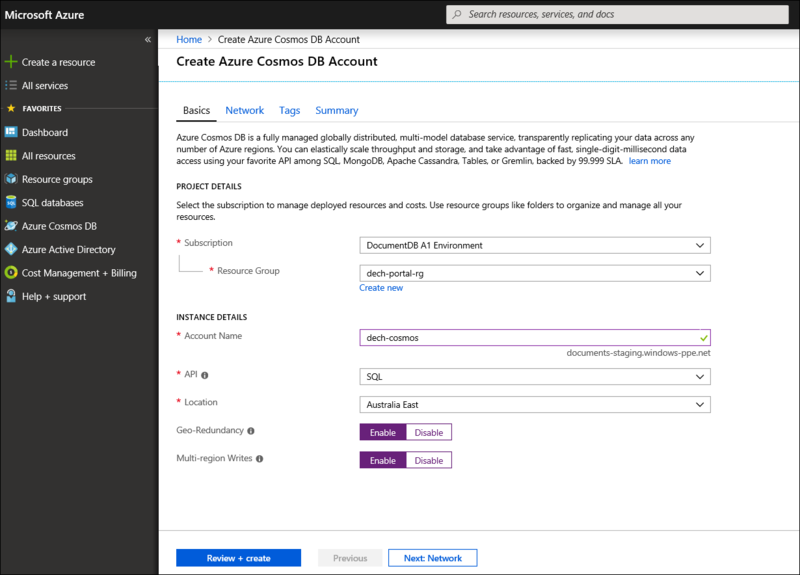 We’ve updated the Azure Cosmos DB account creation experience in the Portal. Now, you can take advantage of the full screen when creating new Azure Cosmos DB accounts. You can also track the status of your account creation. The Azure Cosmos DB Portal can now show you alerts, recommendations, and messages for your account. To see them, navigate to the Overview tab and view the Notifications section. For example, the recommendation below suggests that many values of the partition key property in a collection are null and should be reviewed to ensure a good distribution. The Azure Cosmos DB Emulator provides a local environment that emulates the Azure Cosmos DB service for development purposes. The emulator allows you to develop and test your application locally, without creating an Azure subscription or incurring any costs. If you’ve ever tried to set up the Azure Cosmos DB emulator to run as part of your build and release process, you know it can be hard to maintain. Now, you can use the new Azure Cosmos DB Emulator build task extension for Azure DevOps (formerly Visual Studio Team Services). With the build task, you can run tests directly against the emulator, all as part of your CI pipeline! To get started, follow the tutorial and install the extension from the Marketplace.